Are You Sick And Tired Of Needing To Build Web Pages That Are A MILE LONG, Just For Good Keyword Density? Are Your Visitors Sick Of Seeing Them? Could Your AdSense or Content Sites Possibly Survive Without Them? Introducing A Software Program That Creates Search Engine Readable Windows of Opportunity! Now theres a software product that does not use an iframe to shrink your content and produces a search engine readable content box that you have complete control over! I was at the end of my rope when it came to producing AdSense or content sites that didnt look like click farms! You know the type. 14 pages of search engine food with a few affiliate links thrown in for flavor. Yep, I had nearly given up. Then I discovered a revolutionary new way of integrating keyword rich content into my web pages using a little known css method. My next call was to my programmer. I gave him the basic idea of how I wanted to use my new found secret weapon and waited for the beta version. Not being a programmer myself, I had no idea of all the things that could be done with css and what my programmer came back with just blew me away! Once I had my hands on this feature rich software, the only thing else I could ask for was a Control Panel to match! And thats exactly what he gave me! Did you know there were so many scroller options? Fill your Window of Opportunity! Make sure youve got it right! The Content Clamps easy to use button navigation Control Panel puts you in charge of every aspect of each window of opportunity you create! Now that youve seen how the Content Clamp allows you to create user friendly web pages with search engine readable windows that will hold all your keyword dense content, what are you waiting for? This is a must have tool for any AdSense Marketer! 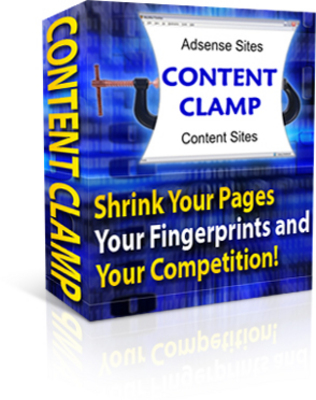 It doesnt matter if youre just starting out or a seasoned veteran, the Content Clamp software will help you create websites that visitors will want to come back to!